Just minutes from my house in Ghana, lies the most incredible picturesque university campus you will ever see. Ashesi University College, a relatively small liberal arts college offering undergraduate degrees in business, computer science and engineering, sits on a stunning 100 acre campus high up on the Aburi mountains overlooking the capital city, Accra. I visited the campus a few years ago and it took my breath away. I have since followed it closely and would like to share you just 5 of the many reasons why it is a cut above the rest; why it’s an institution that does Africa proud; and why I would be so thrilled if my child went to study there some day. Mr. Awuah’s story is remarkable as you may have seen from his TED Talk. He left his lucrative career in the US as a Microsoft engineer and returned to his home country, Ghana, to start a university that would educate the next generation of African leaders. In his words, “The world needs to change in this way and I strongly believe that people like me who have had the privilege of a great education need to be part of the solution; that I need to be really actively involved in helping to drive this change in Africa so that 30, 50 years from now, the world will be a different place for all people of African descent in the world.” (CNN, 2013). As a fellow Diasporan, this speaks to me in so many ways. Not only did he set up what is now a world class institution, he ensures that leadership and ethics are ingrained in the curriculum. Ethics and leadership are the very foundation of an Ashesi experience. Ashesi is churning out world class engineers and entrepreneurs who are trained to be innovative in providing solutions to local development problems. I’ve read about first year engineering students building solar-powered irrigation systems (shown in the photo above). A computer science graduate, Andrew Abbeyquaye, built a public transport (tro tro) transit system. Using the tro tro data, Andrew built a transit planning app to help users obtain a travel itinerary for their journeys within Accra while minimizing travel distance and time. There are so many of these incredible stories on the Ashesi University website. This one is particularly special for me perhaps because I’m involved with Greenpeace Africa and like many Ghanaians, appalled with the excessive use of plastics and disregard for the environment in city of Accra. With a World Bank grant, Ashesi is now hosting the Ghana Climate Innovation Centre which serves as an incubation hub for green start-up businesses. The Ashesi university campus also reflects its environmental sustainability commitment in how it recycles, conserves water and uses energy efficient technology. I’m sure the faculty are all super awesome but when the head of computer science is a Ghanaian woman with a PhD in Robotics and Artificial Intelligence….. I MEAN!!!! Dr. Korsah co-founded the Africa Robotics Network, to help get more people in Africa interested in Computer Science through Robotics. Respect! The university subscribes to a set of principles (the Ashesi way) around scholarship, leadership and citizenship. The third principle manifests in the way students actively support their local communities. The University encourages students to work with pupils in the community to develop their math and literacy skills. 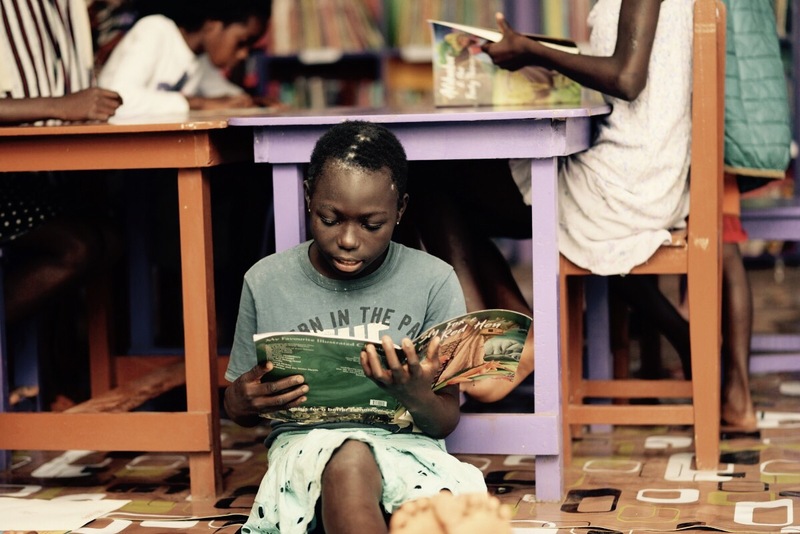 One of the students recently led an initiative to open a first public library in the community where the university is located. A couple of years of ago, two Ashesi students received project funding to mobilise pineapple farmers in the community to form the region’s biggest farmer cooperative and boost economic growth in the area. There are so many things to love about this university. These are just a few. Its truly awe-inspiring to have such institutions on the continent. And these students are just under-grads! I have studied at four universities on 3 continents and my experience does not compare with what I’ve read about Ashesi. If Ashesi grads are the new crop of leaders in Ghana and on the continent, then I’m very much hopeful about our future! Posted in Arts, Places and Culture, Economic Development, Entrepreneurship, People and tagged african development, african women, Ashesi University, development, education, Ghana, higher learning, Local economic development, Patrick Awuah, solutions, technology, women in technology. Bookmark the permalink.